Spatially explicit and dynamic urban growth models provide valuable simulations that encapsulate essential knowledge in planning and policy making such as how and where urban growth can occur and what the driving forces of such changes are. Agent Based Modeling (ABM) yields a useful framework for understanding complex urban systems and provides an arena for exploring the possible outcome states of various policy actions. Yet most research efforts of this sort adopt physical and heuristic approaches which tend to neglect socio-economic dynamics which is critical in shaping urban form and its transformation. This research project has two main goals. First, it develops an agent based urban simulation model which has a more rigid theoretical explanation of agent behavior than most such models hitherto. To achieve this, the research integrates microeconomic theory into an agent based modeling framework. Utility maximizing residential location choices made by households are modeled as the main impetus for urban growth through agglomeration and sprawl. Then random utility theory is used to capture the stochastic nature of agent behavior. 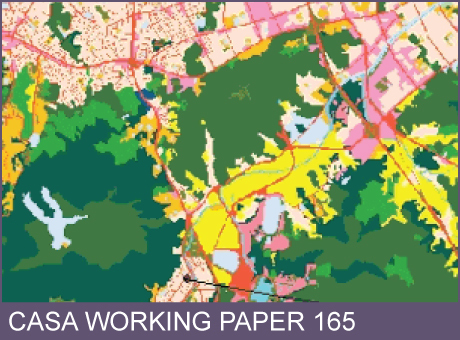 Second based on such urban dynamics, alternative planning policy options such as greenbelts and public transportation are modeled so that their impacts can be clarified. In this way, the model examines how planning policy alters the economic utility of households and redirects market-led urban development. This working paper is available as a PDF. The file size is 1.37MB. Download working paper No. 165.